After being jilted the day before her Christmas wedding, Sara Jane hates the holidays. 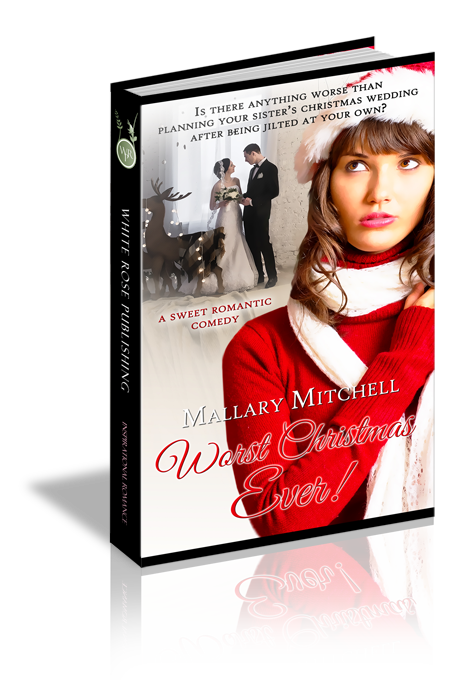 Holly and mistletoe are a painful reminder that happily-ever-after isn't for her. Now, this Christmas, her baby sister is getting married. Talk about adding insult to injury! Forced into faux Christmas joy while she helps plan the nuptials, Sara Jane just wants to escape to Athens, Greece--away from the judgmental stares and snickers of her family and friends. God, on the other hand, may have other plans. Maxwell Dixon has secretly loved Sara Jane since they were children. Like so many tragic childhood love stories, however, he was relegated to "friend status" long ago. But when Sara Jane needs him for moral support and to be a safe date at the wedding, Max decides it's time to show Sara Jane what love and Christmas are all about. “Sara Jane?” Her five-year-old cousin called up the stairs. “I’ll be down in a moment. Finish your movie.” In the privacy of her attic bedroom, Sara Jane Connolly wiped her tears and gave in to temptation. She pulled the wedding dress over her head covering her tank top and jeans. She wouldn’t be wearing the shimmering, bead-encrusted, perfectly-fitted fairytale dress tomorrow because her fiancé had dumped her yesterday. So had her family, essentially. They’d gone to the Christmas village without her “because she’d just be a dampener on their trip to see the holiday lights.” Her heartache hadn’t stopped Mom from volunteering Sara Jane to babysit Sam. Evidently, she wouldn’t dampen the spirits of a five-year-old. OK, so Brad didn’t really talk like that. In reality, he hadn’t said anything at all. He’d texted her. Yesterday morning. Her tears stopped falling as the dress’s progress came to a full stop. She tugged a bit more. The dress had been roomy ten days ago. Now, she stared into the antique oval mirror as best she could through the neck of the dress. Sara Jane made a frantic turn, first right and then left, trying in vain to get a grip on something to pull. Her hands poked from the sleeves like the tiny limbs of a rampaging T-Rex. Breathe, Sara Jane. Being slightly claustrophobic, her heart raced. Adrenaline surged through her veins. She tugged some more. Sara Jane attempted to shimmy from the dress. She tried to pull it down farther. No luck. Maybe if she could back out… She tripped over a box and landed hard on her backside. “I fell.” And the boom wasn’t so big. She couldn’t see but heard Sam padding toward her. “I’m starvin’.” The loud gurgle of his stomach punctuated the claim. The dress turned slightly, but wouldn’t budge up or down. She strained her neck and peered through the opened zipper portal with one eye. She stopped. What was it one was supposed to do to remain calm? Oh yeah, breathe deeply. Sam’s gaze raked over her. His mouth hung open. His eyes were wide. At five years of age Sam wouldn’t be much help, but maybe, just maybe, he could change the direction of the force, and her arms would be free of the shrink-wrapped sleeves. Then, maybe she could extricate herself from the constricting band of the bodice, and breathe. That was a lot of maybes. She whined and he grunted. Her composure was failing. She now felt faint. She was going to die in this dress. There would be urban legends years from now about a jilted bride who died so tragically that sometimes you could still see her on this very spot, wailing through an open slit in the dress that suffocated her. Lord, help me out of this mess. I’m obviously losing my mind. “I know just what to do.” The light of discovery on Sam’s little face gave her hope that she would not die this Christmas Eve eve from being squeezed to death by her own wedding gown. Sam grabbed her phone, padded down, and then up the stairs. As he drew closer she made out that the muffled voice on the other end was male, but she couldn’t catch his words, so she listened to the one-sided conversation. “Sammy?” Sara Jane called. “Honey, what number did you dial?” Her tone dropped to one of utter horror…to whom was he speaking when he’d said she needed the “jaws of life”? Obviously Uncle Brendan, the editor of a newspaper, hadn’t taught his son the concept of a full stop in speech. Talk about a run on sentence. Sara Jane made a Houdini-esque attempt to free herself. Dear Lord, I know I’ve not been praying enough or going to church enough, but could You please help me? Help me get out of this. I need help here. “Did you call your daddy?” Uncle Brendan would never let her forget this…ever. Her little cousin began telling her about something or other, and she just smiled and tried to keep breathing. It was becoming increasingly difficult. That was quick. The floor creaked with steps from someone much larger than Sam. Max. His baritone voice washed over her. He must have been at his parents’ house across the street. She felt the heat of his body as he stood close. She looked one-eyed through the open zipper again into familiar caramel eyes. Lord, I’m ready to go now. Take me, please. “Yeah. Mom gave me carte blanche. So I did a few updates. Are you home for Christmas?” She tried to ignore the fact her muscles were now starting to spasm and she was still stuck in a wedding dress. She truly wished the attic floor would open and swallow her. A little smirk showed on the face she knew as well as her own, right down to the little scar above his lip where a baseball had hit him smack in the mouth when he was sixteen. Interviewer: After reading your story, Sara Jane, I have a few questions. Do you mind answering them? Sara Jane: My tendency to humiliate myself aside, fire away. Interviewer: Well, you never told us why you were driving your sister’s car after the final dress fitting? Sara Jane: Alexa couldn’t get her key out of the ignition a few weeks back. But she figured out why. When her car rolled forward, into the rear end of mine, she realized it wasn’t in park. So until mine was fixed she borrowed Riley’s. Interviewer: Oh. Wow. So your pain started way before the wedding weekend. Sara Jane: Well, that’s it. I was mad—sure. But that verse sums it up. It’s all things work together. Notice it’s not “All good things.” It’s all things. So even if you’re in a horrible trial now, you have to remember that God doesn’t just work in good times, He’s there in the bad times. He is the One who sees that final picture. If my car hadn’t been in the shop, I wouldn’t have had a reason to ride with Max, and that was a blessing. Maybe it was those extra trips back and forth to sites with Max that finally got him to speak up. I don’t know. But I do know that God sees the big picture and what happens in our lives is part of a bigger plan. It’s like when I go in to a house and it’s a dump. Interviewer: I’m not sure I follow you. Sara Jane: So I go into a dump and what I can see are good lines, interesting features, and possibilities. I like to think of God as an interior designer. He looks past the proverbial, bad carpet, poor layout, and you know, that ugly wood paneling. He goes to work and gets us into shape. I’m glad and grateful to God for His Divine renovations and His love for fixer uppers.